For YEARS, my daughter has been BEGGING me to get her ears pierced. In fact, she’s also been very angry with me. 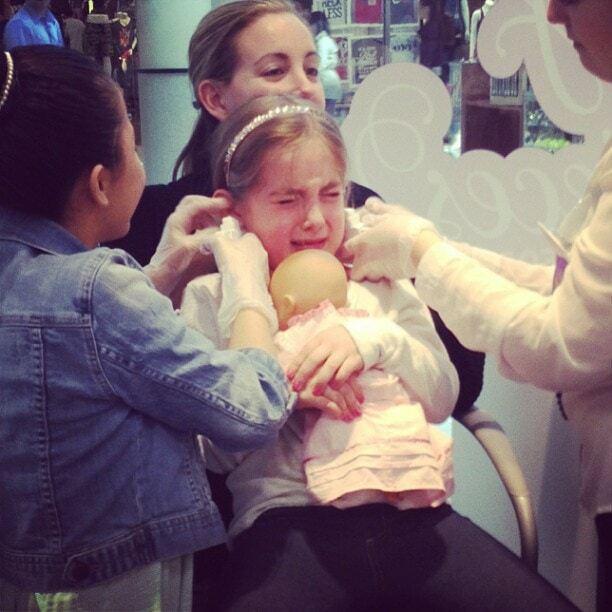 You see – I got my ears pierced when I was 6 months old. So, I never had to deal with the FEAR that Natalie has been building up for most of her life. Every SINGLE time we went to the mall, I would always ask her if she wanted to get them done. And she would always start to cry. Just the THOUGHT of getting them done would bring her to tears. But I’m persistent because I knew that my little girl wanted to get them done. She REALLY REALLY WANTED EARRINGS. Well, finally – she found the courage to do it. It wasn’t pretty. But as soon as it was done – my little one was proud and full of smiles. Here she is the next morning showing off her new studs. Previous Post: « Bejeweled Board Game Review (VIDEO): If You Love The App, You Will Love This Hasbro Game!